Seawalker was set up in the year of 2000. Club Aqua warranty your safety during the Seawalker activity, as its unique helmet design enable you to breath underwater normally or the same way as your breath on the surface. The helmet was originally design and manufactured in Japan, the Seawalker home base. It is suitable for age between 09 – 70 years old. Overall experience was great but too short. Spent too much time feeding fishes. My wife and I are non-swimmers and we thoroughly enjoyed our seawalker experience. The tour facilities at the Puri Santrian hotel are excellent. We entered the water around 11:20 AM and were back up in the bota at around noon for a 35-40 minute walk on the sea floor. It was wonderful to see the hundreds of colorful fish when you pump out fish food from the bottles the staff provide. The underwater crew was oustanding and extremely helpful. Very professional and helpful staff. Amazing experience, good coral with a lot of fish. Pricing of photos could be a bit cheaper. the experience is amazing. this is my first time going underwater. to be able to breathe and walk on the seabed is somewhat magical. however, my pictures are all blur. the helmet has scratches and old. the pictures taken underwater could not see my face properly. the time underwater is less than 30 mins as stated. We had a fantastic time seawalking with this crew. Everyone was really nice and even kept my daughter entertained aboard as she was too scared to come down with us. 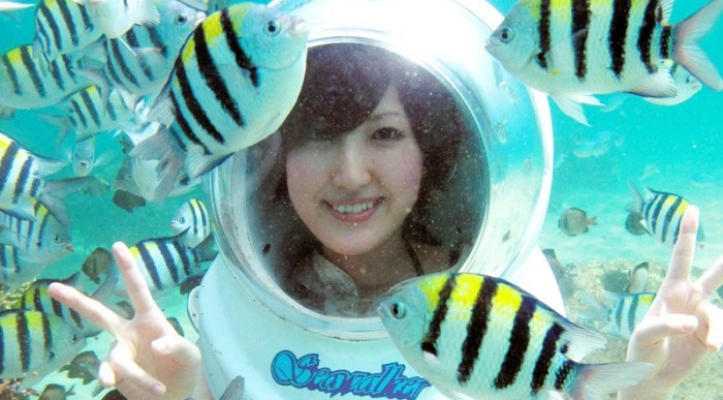 She told me she was very happy :) Saw a lot of fishes, they also helped us taking pictures around the reef with our camera. I felt really safe and it was so much fun. Definetely recommended! They are very kind, always taking photos of us with our camera! We think everybody should have this experience!!Amazing!!! It was good, but the duration was not as communicated earlier. It probably lasted 10-15 mins. This was one of the best tours I've ever done, the staff were amazing, so friendly and funny under the water, the views were amazing, we got some great footage on our GoPro. I would definitely revommend for anyone to do this!! Great experience and nice staff service !! Excellent, to have a trip to seawalker, all staff very supportive. Remarkable experience! so easy and don't need any swimming or diving skills. Just a minor points, it would be better if the guide communicate every single steps. I was a bit shock when they submerged me right after putting my helmet on without any prior notification. And also would be better if you put some notes (on the website) regarding the best months or best times for doing this activity. I was a bit unlucky as had to face quite strong current and unclear vision. Overall it was great! and will do it again! Very nice experience. We really enjoyed it. The only thing that a little bit disappointed us is that it was a little bit short. We were expecting to stay 25-30 minutes under the water, whilst we stayed there maybe 15 or so. Great trip! It was like being inside of a fishtank! You're down on the ocean floor long enough to get a good view, but not so long that it is overwhelming. For those who may never scuba (like me), it is the perfect way to see such things up close. Fantastic Experience watching thousands.. Literally Thousands of Fishes swimming around you. From start to finish it was a great experience. 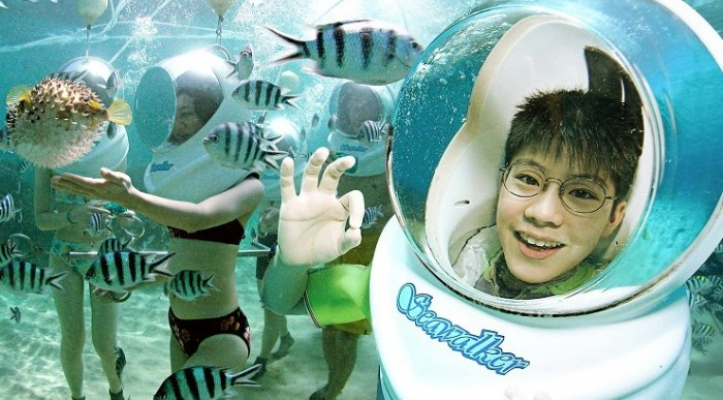 Professionally managed Sea Walker experience. They provide you with all the required gear and Towels etc. One small cons is the small boat driver who was constantly in a Rush and did not complement the overall excursion. However, excluding the odd small transfer boat driver, everything else was perfect. Was a nice experience but would have preferred more underwater time. Atleast good 30 minutes rather than the 15 minutes or so. Overall fantastic service. Thanks and Cheers ! 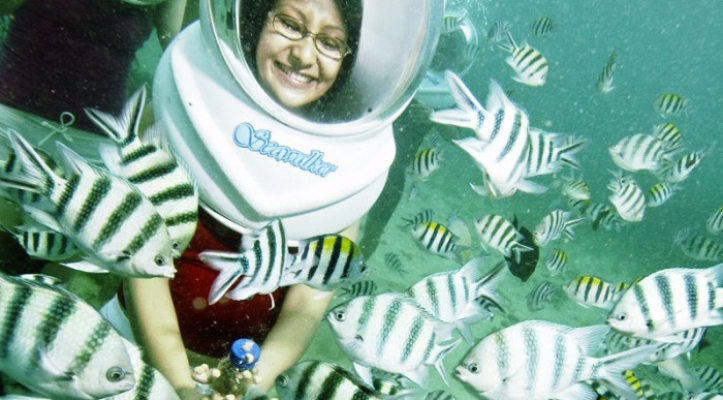 It's amazing & awesome trip in Bali for this seawalker tour. Everyone should try once if u are going / in Bali. 2 girls loved it - unfortunately, costraphobia got to me as soon as the helmet went on. Expérience inoubliable ... Personnel tres professionnel et qui accompagne lorsque qu'on ai hésitant a toucher les poissons ... MÉMORABLE merci à l'équipe!! It is fun and very wel taken care of, but I did feel a bit pushed to hurry and do what the instructors sign you to do. That made it an experience, where you have never seen and felt so many fishes so close to you, but also one that felt like I had to hurry all the time. If you're not comfortable clearing your ears or you go into the sea for your first time, then don't go sea walking. But if you enjoy being able to touch fish and want to be overwhelmed by them, this is your thing! We had a wonderful experience and although felt unsure of what to expect and a little worried - all worries washed away the moment we step in the water. Definitely something to recommend.